The homeowners were the first to successfully complete a program that enabled them to restore ownership of the houses they live in after the properties were in danger of being lost because of foreclosure. “We’re turning people who were in foreclosure through no fault of their own into homeowners. 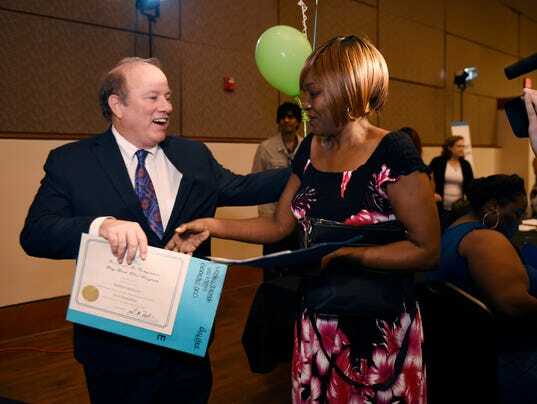 This has been very exciting,” said Duggan at an event celebrating the group’s success at the Northwest Activities Center on the city’s west side. Called the Occupied Buy Back Program, the city’s Land Bank Authority created and runs the initiative. It finalized the pilot for the program two years ago. The program is available to Detroit residents who either lost their homes to foreclosure or are tenants in homes that landlords lost to foreclosure and those residences are in the land bank’s inventory. Under the year-long program, potential homeowners have to attend homebuyer counseling sessions, pay a fee of $1,000 and put one month’s worth of property taxes into an escrow account to pay the next year’s taxes. They must also maintain their homes and keep current on tax payments and water bills. Once they complete the program, the deeds to the homes are removed from escrow and belongs to the owners. Zranda Mosley, 59, was the first homeowner to get the deed for her house from Duggan at the event Tuesday. Mosley is now the proud owner of a brick home on the west side near Davison and Livernois. She’s lived in the house for the last four years as a renter. Last year, her landlord lost the house to foreclosure, sending her into a panic, she said. Mosley called the city to find out what she could do, was told about the program and enrolled. Officials said the land bank has been contacted by more than 1,500 interested in enrolling in the program. More than 560 are currently enrolled in the program, they also said. Duggan said the city’s land bank owns 90,000 properties of which 25,000 are houses. Officials believe people are living in 4,000-5,000 of those houses.